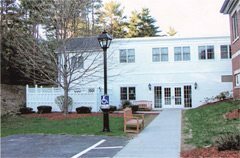 Hi folks, my name is Ryan McEniff, owner of Minute Women Home Care, home care company in Lexington, Massachusetts and today we are going to be talking about how private duty home care can assist with people that go to adult day care centers. Adult day care center is exactly what it sounds like, it’s something where you pick, you drop someone, usually your senior loved one, off in the morning and pick them up in the early afternoon for a day where they have filled with activities, they get fed, they get watched over while somebody’s at work or out doing chores, things like that. How private duty home care can help with that is really the before and the after. A lot of times these senior are living alone or they might be living with their adult children and if they’re living with their adult children usually they have their own kids, they’re trying to get ready for their day of work, get everybody out the door, get to work on time, work really hard and then get back to spend time with their family. Because of this and as most can understand, they’re stretched pretty thin and that’s where private duty can come in, either if they are seniors living alone or living with the adult children. How Does Home Care and Adult Day Care Work Together? We can come in, help them get ready in the morning, get them fed, get them dressed, brush their teeth, they can get showered and then we can transport them to their adult day care center. At the end of the day a lot of adult day care centers end anywhere between 3 and 5 o’clock maybe some are different in your area. We can pick them up and then bring them home, get them fed again or just really stay with them until their family members are back. If the senior lives alone we can certainly spend the night with them or we can spend a few hours with them until they go to bed and then we can leave. So that’s really how adult day care centers and private duty can work in conjunction with each other to make life a lot easier for the family members around them. So if you have any questions leave them in the comments, I’ll answer them best I can and we’ll have another video for you next week. Thank you.